Its pouring rain. I spent my whole weekend being ridiculously productive and working like a maniac. And it’s my best friend’s birthday. So simply put: it is a baking day here in the Healthy Hipster kitchen. After spending way more time than I’d like to admit trying to think of just the right recipe for her birthday treat (carrot cake? banana bread? classic chocolate chip cookies?) I was hit by a stroke of pure genius. Why not take her favourite peanut butter, chocolate & banana breakfast smoothie and turn it into a freakin’ BROWNIE?? YES YES YES. And no this is not the healthiest recipe I’ll ever post. But we’re talking dessert here. And it is still free of refined sugar, dairy and the eggs can easily be swapped for vegan replacer or flax eggs (1 tbsp ground flax: 3 tbsp water/egg). Y’all ready for this? Slice bananas and toss together with 1 tbsp melted coconut oil or butter and 1 tbsp of honey or agave. Arrange coated banana slices along the bottom of an 8 x 8 inch pan. 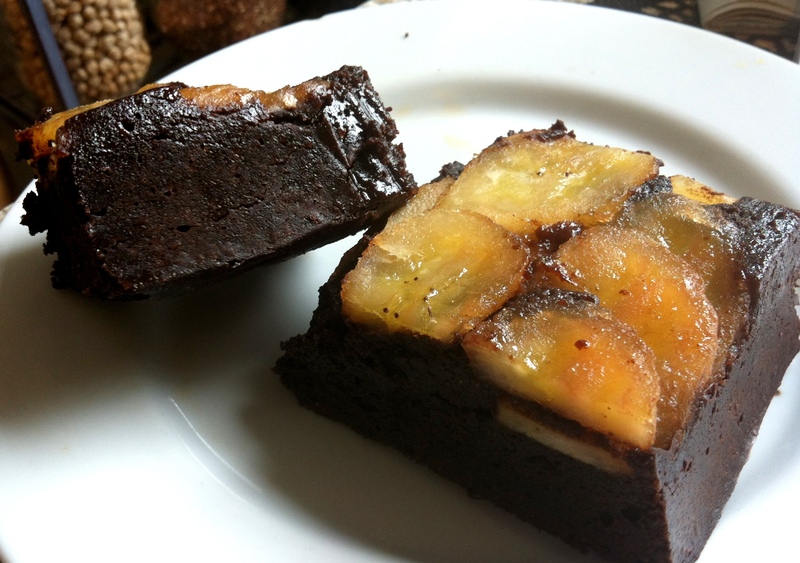 Note: You will flip the brownies at the end so the bananas will end up on top! Position a rack in the lower third of the oven and preheat the oven to 350°F. Combine the earth balance, peanut butter, turbinado sugar, molasses, coffee powder, cocoa, almond milk and salt in a medium heatproof bowl and set the bowl over some simmering water so that everything melts and combines (you can also do this by heating ingredients in the microwave for 20-30 seconds, stirring, heating again, etc. until combined). Remove mixture from heat and stir in the vanilla and eggs, stirring vigorously. When the batter looks thick, shiny, and well blended add the flour and stir until you cannot see it any longer. Spread brownie mix evenly over bananas but don’t worry about making it too pretty, since you will flip them at the end anyways. Bake until a toothpick plunged into the center emerges slightly moist with batter, mine took about 40 minutes. Allow the brownies to cool for about 10 minutes in the pan and then FLIP them onto a rack or baking sheet to cool completely before cutting. Optional: After flipping, return brownies to a hot oven and BROIL for an additional 5 minutes or so until the topping starts to brown and they take on that caramel “brulee” colour. The end result is a very dense brownie (not at all cakey) that maintains a crisp chewy bottom because you’ve flipped it. The peanuts and bananas are subtle in flavour, with the dark rich chocolate taking centre stage…which…let’s be honest is pretty much the point of a brownie right? All in all I am very pleased with this experiment and look forward to many more baking adventures throughout the holiday season. What’s your favourite birthday treat? Are you a birthday cake purist or do you opt for a little adventure? P.S. How amazing is it that this recipe is coming immediately after my “I love salad” post? What was I just saying about how much I heart balance? Too good. Wooooo you post the best recipes! 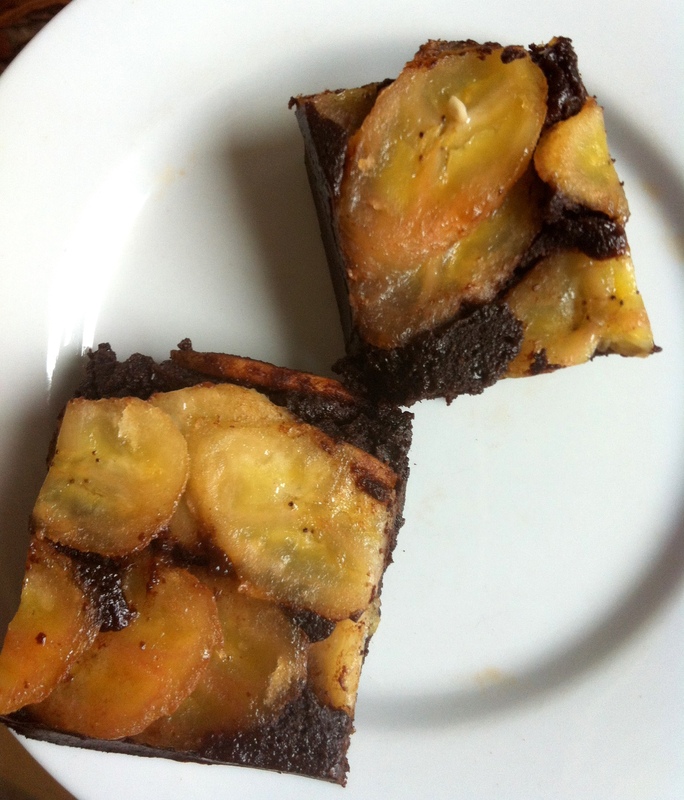 Chocolate, pb, bananas, and espresso….is that a dream or what?